There have been many discussions on Adsense placement, with the two extremes being make them really stand out so that your visitors can’t fail but see them or blend them in making them look like they are part of the content on your site. This is my take on the two extremes. Multiple units, I often see this on low quality sites where they are splattered with Adsense units and you often have to scroll to see the actual content. Whenever I see two vertical rectangles next to each other it’s the first and last time I’ll visit that site. Making the links on your ad units the same color as your regular links. I generally like this approach as it adds to the aesthetics of the site. This is when a site is laid out so that the actual content, or navigation uses the same layout as an advert. Both of these methods can work, but it should never be just about the clicks, it’s also about quality. If you trick a visitor into clicking an ad by excessive blending you’re going to suffer in two ways. First you’ve lost and likely upset your visitor and second they are unlikely to convert for the advertiser which will upset Google, if traffic from your site has a poor conversion rate you are likely to be hit by smart pricing, meaning you get paid less per click. What I find works best is to use adsense but not give it too much prominence to my regular visitors or visitors to new content, readers like this I want to make feel welcome and encourage them to come back (I’ll make money from these using affiliates and CPM ads) whilst with search engine traffic and older pages I’ll give Adsense more emphasis by both blending and optimal position, without I hope degrading the look of the site. I’ve been trialling this for the last couple of months and while Adsense income is down I’m finding affiliate income on the rise and I personally feel happier by the look of the site. 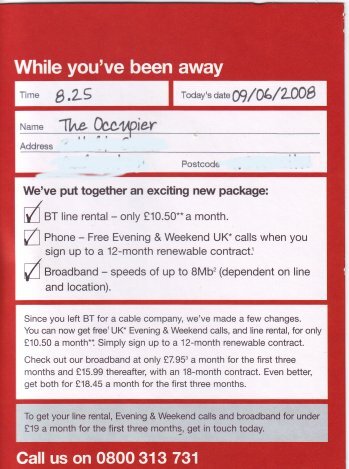 On the advertising theme I received the following great example of an offline advert in the post. It was a product I had no interest in but the way they’d done it certainly got me to read it. If you don’t recognise the layout, in the UK you receive very similar looking slips when you miss a parcel delivery (something I do a lot) so I thought this was very cleverly done, if it was on your door mat would you of picked it up and read it? Are you sure google tracks ad conversion? I thought they only keep track of referral conversion. Google tracks a load of stuff. They can measure quality of traffic by seeing how long they stay on the advertisers site, conversion if the advertising is using it in Adwords. Click fraud will certainly be one of the things they want to detect but not all. Wow, very clever. Of course, I would be so mad at the attempted deception that it would make me go out of my way to avoid the company in the future. I despise both deceptive ads and anything that people leave on my door/doorstep/lawn. What good CPM programs can you recommend ? Google will track your conversions – read up about smart pricing. Best just to test your adwords placement and colouring to see what gets an improved CTR as well as an improved revenue per click. The general rule I use is if the adsense is going to be in a predominant area (dark orange on google heat map) I blend the ads but not so much that they look like part of the navigation bar or something that would take you to another area of my site. If the adsense is in a less predominant area and needs attention drawing to it then I use standout ads. I also think it is good to have a mix of standout ads and blended ads as it can also bring a nice balance to your web design. As you pointout – sometimes it best to blend the ads other times it isn’t. So, how exactly do you implement this ‘rule’ of when to show adsense ads on one site. Like, how do you say, do not show on new posts or for return visits, but show for posts where people have come to the site from a search engine? I wouldn’t know how to do that Justin, I just have a set design for each website that every visitor will see exactly the same. You could have a script built so it reads the referral source and shows different design elements accordingly. I think some ecommerce stores do this on their homepage so dependent on the search term used to land the visitor on their website (from an SE) you see promotions for the products you were searching for which should lead to better conversions. I don’t use adsense, but if i were going to then it would definitely resemble something from this blog. I like the little green boxes. It sticks out, but isn’t overwhelming. It’s got to be top left, blended for me. If your site has blue then all the better. Ian’s last blog post..Which tickets for Disney World? Google Heatmaps stresses on placing the ad on the left side, then why does Google.com has its sponsored results on the right? I don’t see them following the heatmap. Is it because they value organic results more? I belive that it is. Googles primary goal is to serve people searching. Given paid ads too prominent a placement will lower peoples perception of the overall quality of Google. Mikael’s last blog post..Is Seth Godin Telling Us To Steal From Adwords Publishers? Google has built its business around providing the most relevant results possible to a searcher, otherwise they would simply be a paid directory. Another idea may be to integrate adsense code inside comments. Google’s algorithm is such that it displays relevant ads depending on the proximity of the contents. Love the advert! You’re right, in the UK we get those if we miss a parcel delivery! I certainly would pick it up and read it – no doubt about it. VERY CLEVER! haha, I think that advert you got in the post is great! I would definitely read it, but I might feel a little mad afterward for being tricked. I’m still torn up about whether or not to blend in adsense ads, but this post gave me some good points to think about. Some good comments here, i have tried both methods and it was definately all about the click but in hindsight it should have been all about the user!! Google 101 make websites for users not search engines!